If the Moon had beaches they would look like those of Santorini. Surprising in beauty and diversity, Santorini is probably the most special island of the Cyclades. 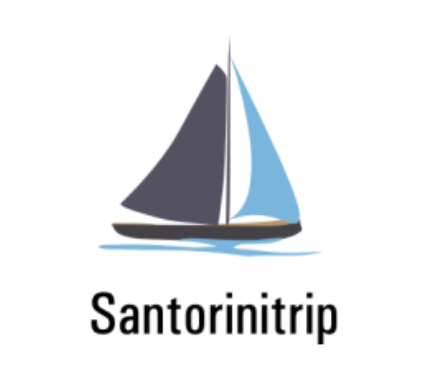 If you are looking for beaches beyond the usual combination of “crystal blue waters, fine sand or pebbles” then Santorini is the ideal choice for you. The volcanic rocks of the island, due to the multiple geological redevelopments caused by the volcanic eruptions, with the characteristic black sand that the visitor encounters on most of the beaches of the island, combined with the deep waters of the South Aegean Sea, create a mixture of beaches that you cannot easily find elsewhere. It is a small seaside picturesque settlement in the northwestern part of the island, just below Oia. Accessible either by boat, or on foot from Ammoudi, or by donkey from Oia, descending 286 steps. Its beach is small, with red and black big rocks emerging from the deep waters, ideal for swimmers looking for unique swimming locations. In the surrounding area you will find a diving center, as well as small traditional taverns with local appetizers. Covered with black volcanic sand, like most beaches on the island, the beach of Baxedes is one of the most famous beaches of Oia. It is the best choice for those seeking tranquility and absolute relaxation during their swimming. You will rarely meet many people on this beach, since it is not preferred by young people but by families with children and surfers (due to strong northerly winds). It is located in the northern part of Santorini, 11 km from Fira and consists mainly of black sand and rocks. Are you seeking loneliness and isolation? The beach of Kolumbos is ideal for you. Very close to Baxedes, Kolumbos is a remote sandy beach, one of the most beautiful of Oia. Arriving at Kolumbos you have to leave your vehicle on the road and go down the tall rock surrounding the beach, through a narrow path. But this little inconvenience is worth it. The rock offers natural shading from the sun while the water are hot, since here the most active underwater crater of the island is located. Do not forget to take with you drinking water, because in Kolumbos you will not find a canteen or a restaurant. 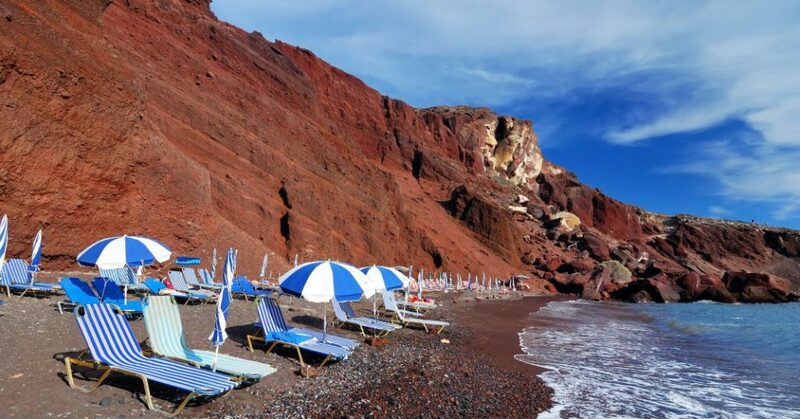 Red Beach is another location of Santorini worth visiting for its diversity. It is located in the southwestern part of the island, very close to the village of Akrotiri. It is a picturesque beach, one of the most famous of the island, although access to it is very difficult. It was named after the dark red color of the sand and the rocks of the area. It offers umbrellas, sunbeds and a unique canteen. Vourvoulos is a quiet bay in the northeastern part of Santorini, with black pebbles and impressive rocks surrounding it. It is not one of the most organized beaches of the island, but it has a few umbrellas and sunbeds, as well as a tavern. In the area you will see mostly families, natives and water sports athletes. Kamari is a large seaside settlement in the southeastern part of the island, with intense tourist flow, mainly due to its proximity to the airport. Its beach is very long and wide, perfectly organized with sunbeds, umbrellas and tourist shops, fine black sand, fine pebbles, and waters that deepen abruptly. At the southern edge of the beach there is a tall, steep cliff, from which many bold bathers dive into the water. It is worth visiting Ancient Thera that is very close, or get on the boat and visit Perissa, at the other side of the rock. Kamari is especially suitable for family holidays, since it has very good hotels, restaurants and a quiet nightlife. It is the favorite beach of the locals. It is located at the east of the island, just between Vourvoulos and Kamari. It is a long beach with fine black sand, very shallow water – so you will see several families with small children – quite organized, with moderate tourist flow. So if you have children and you want to play with them, enjoying family life moments, Monolithos is the ideal destination. There are also many taverns and grocery shops in the area. Perissa is the most economical solution for unforgettable youth holidays in Santorini. It is located in the southeastern part of the island, and it has what a visitor looking for intense -day and night- fun, can ask for. The beach is one of the largest and most organized of the island, with black sand, abruptly deepening waters, diving school, a water park, facilities and instructors for water sports, camping, beach bars, sunbeds, umbrellas, hotels, taverns, etc. Fun never stops in Perissa. If you are in the right mood, everything is possible! Perivolos is one of the most beautiful organized beaches of the island, very long and wide with fine sand and clear deep waters. It is in fact the extension of Perissa beach, at the southeastern part of Santorini. It has intense tourist flow, and it is offers sunbeds, umbrellas, cafes, beach bars with loud music, taverns right next to the sea and many sea activities, but at the same time it is an ideal beach for relaxation since when visitors get a little away from the bars, they can find the tranquility they desire. So, since it combines everything – relaxation, entertainment, food, sports, etc- Perivolos is suitable for all visitors, covering every wish and need. Perhaps the most atmospheric beach of the island, Vlychada will give you the sense of being in a … trip to the moon. It is long, with shallow thick sand and crystal clear waters, deepening abruptly, almost after a few steps – while the majestic, tall, white rocks that surround it give it its lunar appearance. It is located at the southern part of the island, it is easily accessible and it has a quiet canteen (offering the absolutely necessary things) and sunbeds with umbrellas. But if you leave the canteen, you may enjoy a totally solitary swim. In the surrounding area you will find a few taverns with delicious traditional snacks, and if you stay until the sun goes down, the sunset will compensate you. The White Beach is basically the natural extension of Red Beach. The only way to get here is by boat from Red Beach or from Perissa. It is a small beach with black sand and pebbles surrounded by characteristic white rocks which give it its name. There are a few umbrellas and sunbeds but do not forget to bring drinking water with you as you will not find a canteen or a tavern. A very small beach, located at the bay of Agios Nikolaos, northeast of the island of Old Kameni. It is accessible only by boat from Athinios or Fira, but it really is worth it. The whole island is the result of a volcanic eruption, the rocks are black and the landscape is enchanting and wild, while the waters here are yellowish green -thanks to the sulfur- and especially hot ,thanks to the hot springs of the area. You can combine a dive in Old Kameni with a visit to the crater of Nea Kameni. Such excursions are organized daily from Athinios or Fira. The beach of Akrotiri is another remote location of the island, ideal for isolation. It is located at the southwest part of the island, after the settlement of Akrotiri, between Faros and Black Mountain. It is considered the most picturesque beach of Santorini, but the waters here are crystal clear and the view is breathtaking. No need to mention that there is no canteen or sunbeds: the beach of Akrotiri offers you the opportunity to enjoy a solitary swim on a cosmopolitan island.